Whether you are observing Samhain or hitting up a Halloween party, we wish you the best. 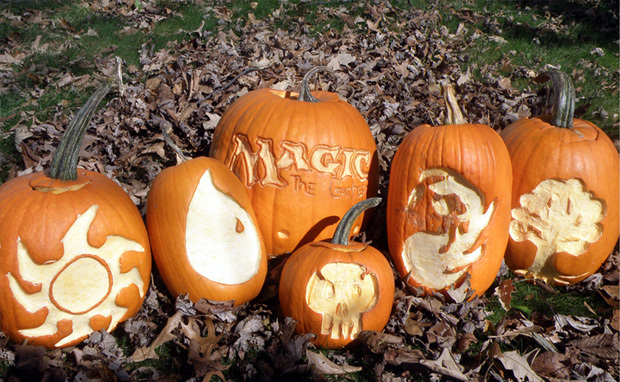 Anywhoos - as it is Halloween, we should probablly have a looky-loo at an appropriately themed Magic: the Gathering build to take to tomorrow's Friday Night Magic event or to play this evening. 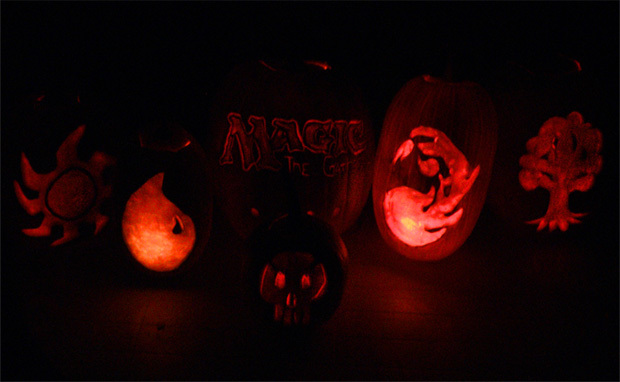 Carved MTG pumpkins from Kevin / Abigail submitted to WotC Monty. The obvious place to start is a creepy trio of Magic 2014 core set cards which is a top-down designed combo. Festering Newt (Common), Bubbling Cauldron (Uncommon) and Bogbrew Witch (Rare) will never likely see play in a copetitive deck on a pro circuit but delivers big on fun. Should you have four Festering Newts and a Bubbling Cauldron, you could potentially deal 16 damage while gaining 16 life. Not too shabby. One cold possibly find the Witch with a Diabolic Tutor then the Witch's ability to find some Newts and a Cauldron to have all the ingredients complete the combo. Even by itself, the Newt is a decent value - for one black mana, you get a 1/1 which can block and kill creatures with 2 toughness. Here's an excerpt from the mothersite - Bruce Richard's Double, Double Toil and Trouble which was published on 2nd July this year. Bogbrew Witch: You have a 1/3 blocker for four mana. You might want to consider activating her ability and giving the Witch a Cauldron in which to stir her brew. 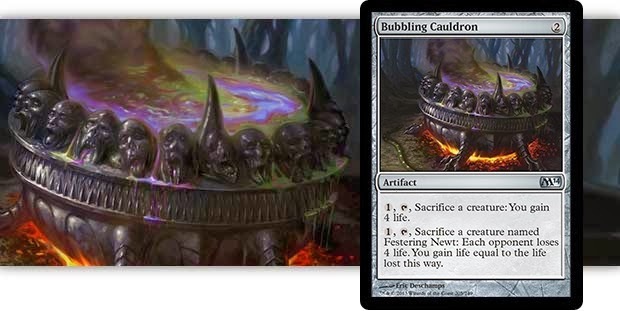 Bubbling Cauldron: You can sacrifice a creature to gain 4 life. If you don't have a spare creature, then I expect your Cauldron will be safe from any artifact destruction since it doesn't threaten anyone. 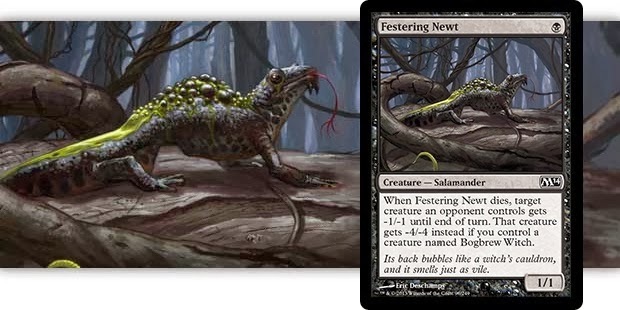 Festering Newt: You have a 1/1 with a minor ability that your opponents will be happy to see you use before a Bogbrew Witch shows up to make him truly nasty. 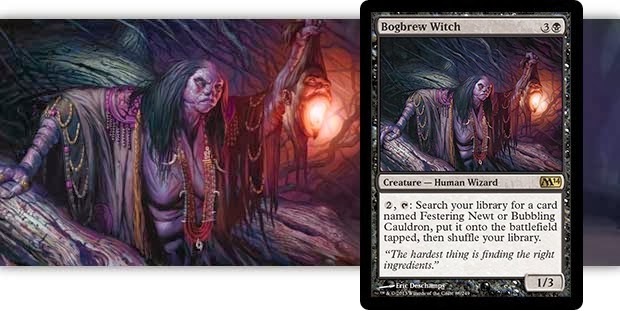 Bogbrew Witch and Bubbling Cauldron: You can block some creatures and sacrifice a creature to get 4 life. Perhaps a Festering Newt would improve your lot? Bogbrew Witch and Festering Newt: Ahh, you have a pretty solid defense and you are likely threatening to do a lot more. Perhaps one of your opponents will decide that killing your Newt now is better than waiting for the Cauldron to appear and cost him or her life as well. Bubbling Cauldron and Festering Newt: You are a minor threat to creatures, since the Newt will give one of them -1/-1, but really, everyone is waiting for you to throw your Newt into the Bubbling Cauldron as part of the bigger life gain and loss. Bogbrew Witch, Festering Newt, and Bubbling Cauldron: The trifecta! If you give a Witch a Newt to throw in her Cauldron, your opponents lose 4 life each, you gain all that life, and one of their creatures is taking a serious hit! 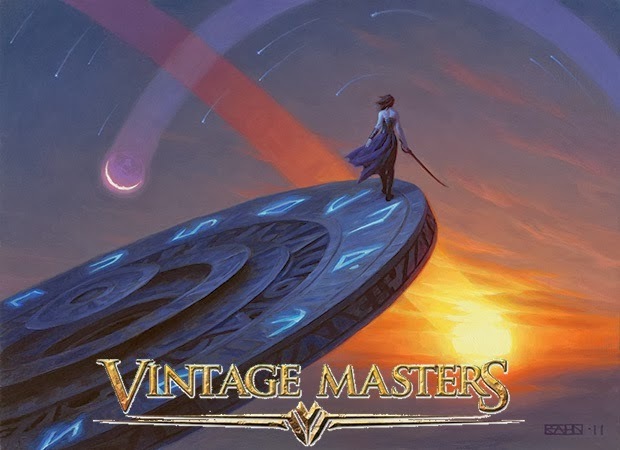 If you find yourself in Philadelphia, Pennsylvania this weekend, and happen to play Legacy (aka Type 1.5) or Vintage (aka Type 1), you'll definitely be wanting to check out the Eternal Weekend hosted by Card Titan at the convention centre. There will be two main events and a number of side events starting on Friday and running all weekend with a number of amazing Magic: the Gathering artists on site including Mark Poole, Dan Frazier, Matt Stewart, David Palumbo, Jeff Menges, Chuck Lukacs, and Bryon Wackwitz. The Legacy Champion receives a special alt-art trophy of Wasteland by Steven Belledin (original art by Una Fricker) with potential pay-outs in the form of store credit to 64th place. 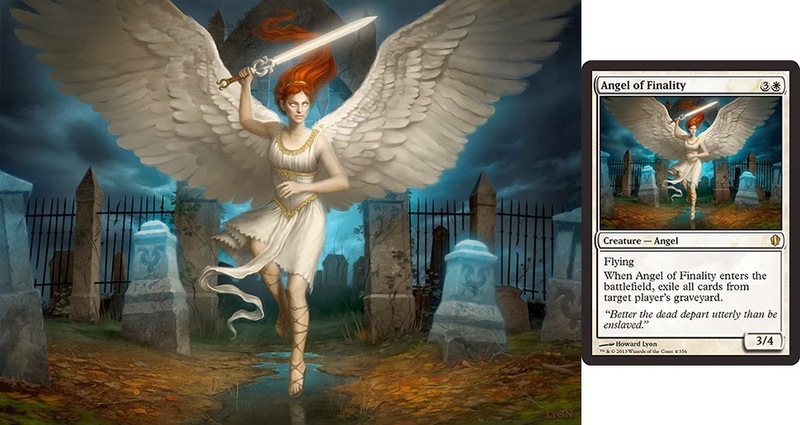 The Vintage Champion receives a special alt-art trophy of Ancestral Recall by Ryan Pancoast (original art by Mark Poole)with potential pay-outs in the form of store credit to 64th place. 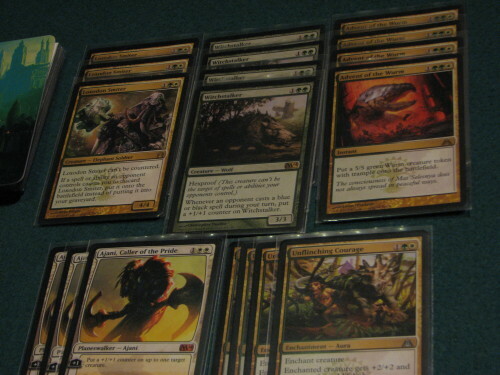 You may recall yesterday's article about Commander 2013 pricing. 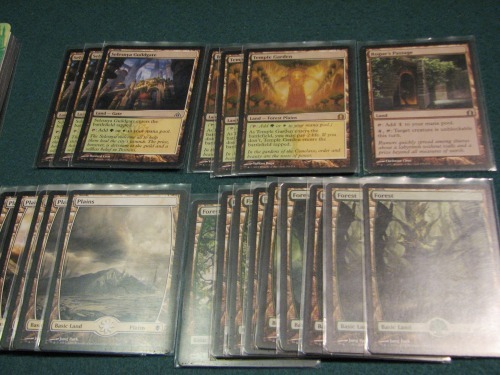 We were yattering last evening and decided that we would rather pick up some singles online from MTG Mint Card for some of our EDH stacks this Friday and then wait a few short weeks until the second print wave hits out local gaming store by which time, prices should hopefully correct downwards a titch which will allow us to grab one or more additional decks. Anywhoos - today we want to talk about our play style for a moment. We love to play under-used / under-appreciated cards in our strategies. 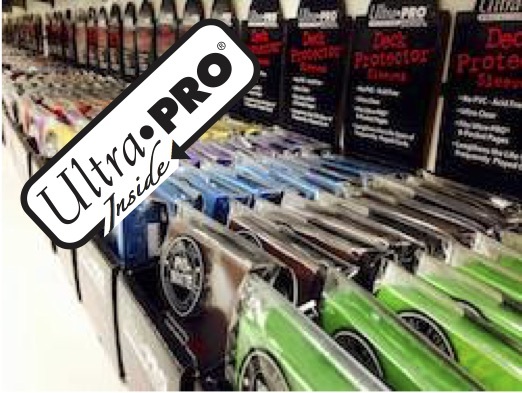 It's difficult to look at the hundreds of cards on our shelves, all perfectly standard-legal, and not use but a fraction of them. To this end, we enjoy developing some interesting kitchen table games (like 'pile draft' where we draft from decksets of commons), or have casual pauper matches in order to better appreciate some of the cards in our collection. Righto - onto today's topic - black 'n' white junk. Perhaps not an apt description but one we could use as there are some questionable card choices or just outright jank which could serve better in another format - but perhaps not standard. It was our aim to use a few cards which we rather liked but did not quite make the cut to popular standard. Let's have a look . . . Nothing totally weird just yet here - a cr@p ton of Orzhov goodies - High Priest of Penance, Sin Collector, Alms Beast, Desecration Demon, Obzedat and Blood Baron of Vizkopa. 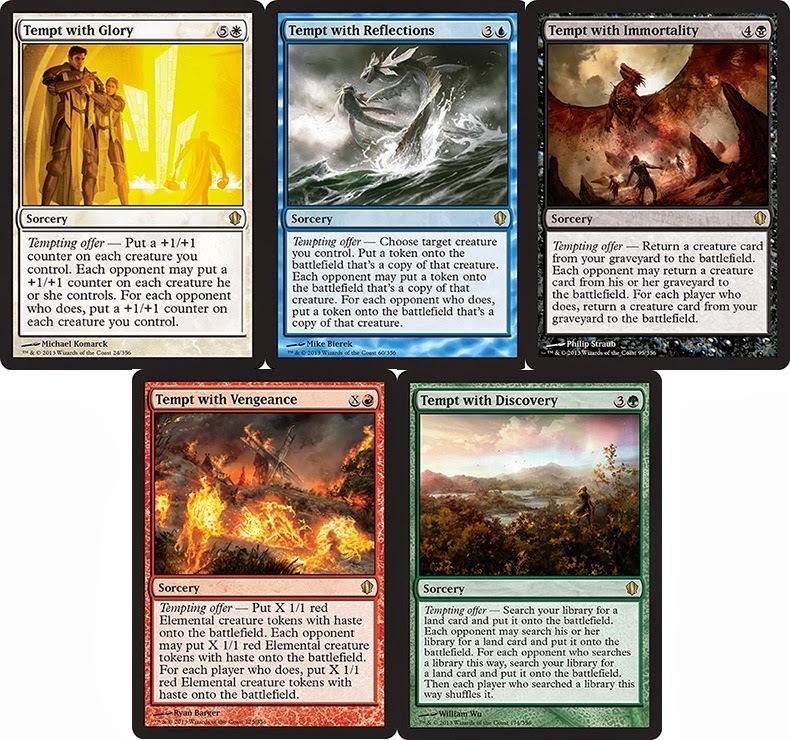 Some of the non-creature spells - thoughtseize, Doom Blade, Devour Flesh, Read the Bones and Whip of Obzedat. Now for some of the interactions we rather like. First and foremost is to nullify the downside of lifelink provided to creatures blocking or blocked by Alms Beast with Erebos - not too shabby. We also would love to get Gift of Immortality onto High Priest of Penance which essentially can nerf non-creature permanents all day long and keep coming back for more. We are also thinking about the inclusion of Ethereal Armor (gawd we do like that card a lot) in this mix as well - perhaps giving a pump and (what some players forget about) first strike. Giving that Alms Beast first strike will mean that you opponent may never get that extra life link. We know this may never get to Top 8 at our local Friday Night Magic event but it does feel rather nice that we are using some of our cards we might not normally use by getting in some games at the kitchen table. 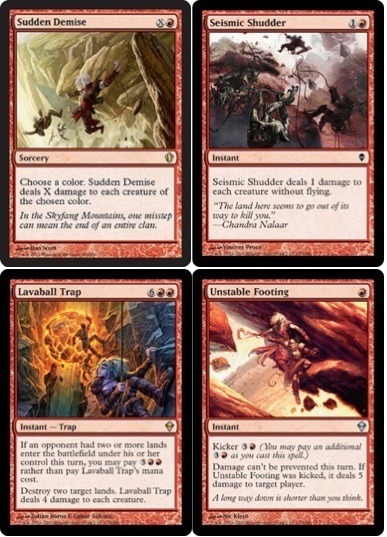 Got a deck you don't feel comfortable letting off its leash at your FNM? Drop a line below in the comment thingy. Over the course of the weekend, we had the opportunity to yatter to a few Magic: the Gathering players - more specifically, Commander (EDH) fans. 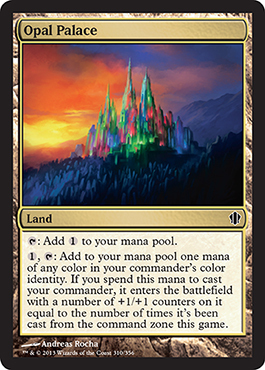 The topic on everyone's list is the pricing of of the soon-to-be released Commander 2013 product on Friday 1st November. The Commander 2013 product consists of five tri-color 'shard' decks reflecting the colors of the old Shards of Alara set, each with 100 cards that are ready-to-play right out of the box. Each box has the option of choosing one of the three legendary tri-colored creatures each deck includes as the commander. Anywhoos - the manufacturer's suggested retail price for each deck was pegged at $29.99 with the price for getting the set of five decks at $149.95 - which, considering the contents delivers fairly decent. Then something rather odd happened on 14th October - an on-line retailed produced a comment on their FaceBook page indicating that distribution of Commander 2013 would be 'allocated'. Essentially, a commercial strategy used in distibution of a limited volume of product, which infers a limited printing run. This concern was put to WotC staffer, Mark Rosewater on 18th October who had replied "Absolutely not. 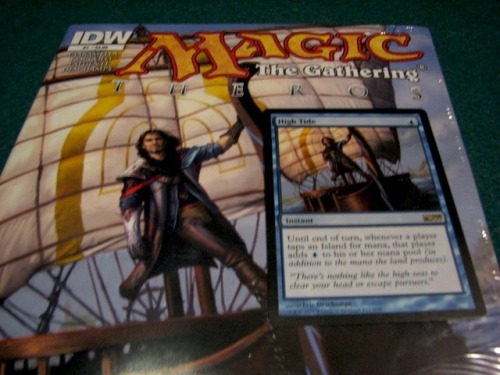 We will reprint Commander 2013 if the current supply does not meet demand" which of course is a bit of a relief. Having said that, on-line retailers who may have adjusted initial pre-order prices from $35 / $40 to $55 / $60 have been sluggish to correct and may not likely re-adjust pricing until after the second print and distribution wave. 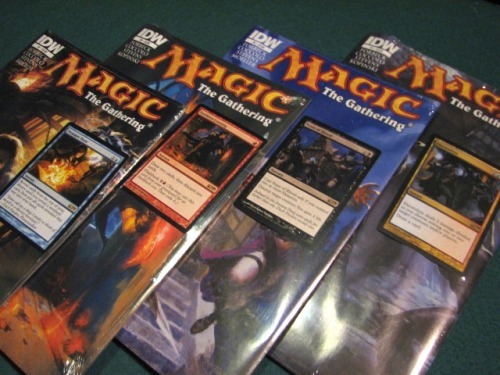 A few players we've talked to indicate that they may simply pick up Commander 2013 at a big box retailer like Walmart or Target which ultimately has an adverse effect on the local brick 'n' mortar gaming stores. Here in Canada as is the case in most places around the globe are not able to order sealed product across borders. To this end, we checked out Canadian on-line retailer Face to Face Games in Verdun, Québec who can ship sealed (French and English language) product across Canada. Their page does list all the Commander 2013 product at MSRP for the moment but had completely sold out with pre-orders. They indicate that when they re-stock, they will make all attempts to be as close to the MSRP as possible - very decent! Personally we were planning on picking up at least two decks at OMG! 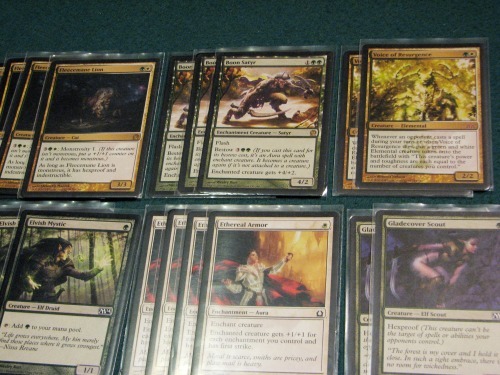 Games here in Barrie and then grab a handful of Commander 2013 singles from MTG Mint Card. We may now just pick up one deck and wait until the second wave to pick to get the other. For reference, here is a snap-shot of what prices are for some selected 'money cards' and sealed product as of Monday morning - this may very well change by this afternoon, so take note. CSI - Cool Stuff Inc. Currently in our fair city of Barrie, Ontario, the last 24-hours had provided a great and wondrous variety of every meteorological condition - rain, sun, snow, wind and some very brief respites of warmth. This has not deterred us in our staunch commitment to get down to OMG! Games, the local gaming store tonight for Friday Night Magic. We currently have three builds ready for standard, a G/W enchant, a B/W midrange, and some unorganised weird R/G creature-centric thingy whose punch line is Ruric-Thar. Anywhoos - we still don't know which one to grab on the way out. What madness makes the Kor and other denizens of Zendikar think ‘Hey! - What a great day for a climb!’ … it ALWAYS results in a bad day for the climber and a worst day for the cute burrowing critter at the bottom of the gorge. The Ondu mainland is crisscrossed by a maze of high-walled canyons called the Makindi Trenches. The canyons represent sheer drops down hundreds of feet, some terminating in whitewater rivers, others ending in bare rock. Mana-fueled winds howl through the canyons at odd intervals, making it important for climbers and builders to attach their instruments carefully to the cliff walls. 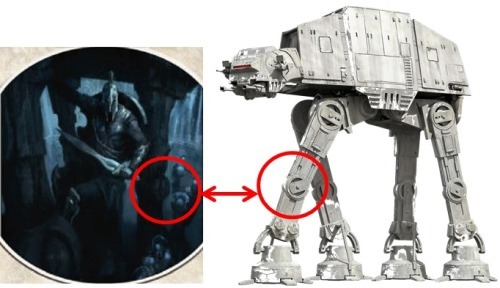 Noted similarity provided by Bhangbhangduc. 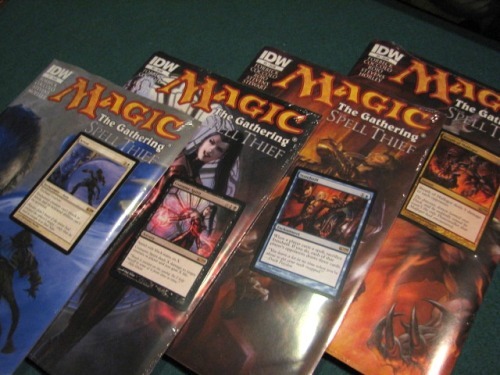 The timing rules changes (effects using the ‘stack’ which replaced the old ‘batch’ system during the games) didn’t go into effect for a month after Classic Sixth Edition came out, which gave people time to get used to the idea of the game changing. To help with the transition, Bill Rose explained the rules in this visual representation of the current timing rules in his “Murk Dwellers” column of Duelist magazine #9 (about the same time that ‘Homelands’ hit card shop shelves). Images from the mothersite. 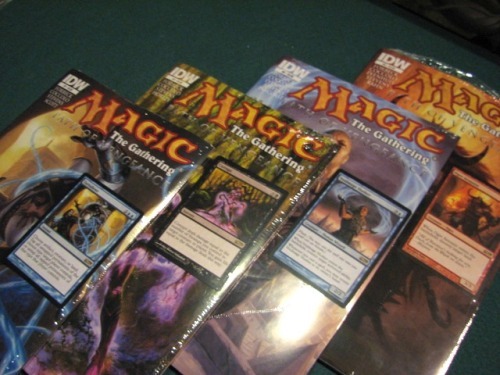 Apparently I have a comic book addiction thingy for IDW Publishing’s Magic the Gathering series. The original series, Spell Thief series, Path of Vengeance series, and the first in the new Theros series. I swear that eventually, one day, I’ll be ripping off the plastic and actually putting some of these very cool cards into decks … yeah … one day. … .tied to a brick. 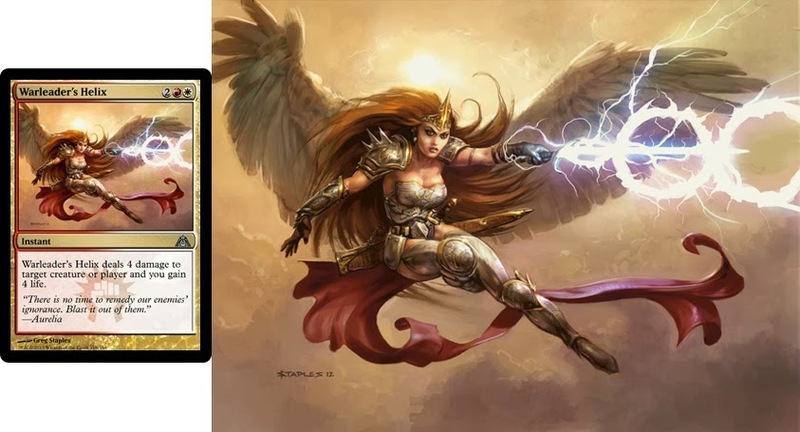 Anywhoos - Commander 2013 Edition is the next product in the Commander series to be released by Wizards of the Coast on November 1st, 2013. The Commander 2013 product consists of five tri-color 'shard' decks reflecting the colors of the old Shards of Alara set, each with 100 cards that are ready-to-play right out of the box. Each box has the option of choosing one of the three legendary tri-colored creatures each deck includes as the commander. The five new Commander decks each contain two brand new three-color legendary creatures and 13 other never-before-printed cards. 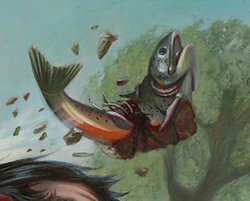 There are also 51 unique new cards spread across the five decks with some cards appearing in one or more of the decks. Introduced in the Innistrad set, Curses are a kind of Aura that enchant a player and have a negative effect. 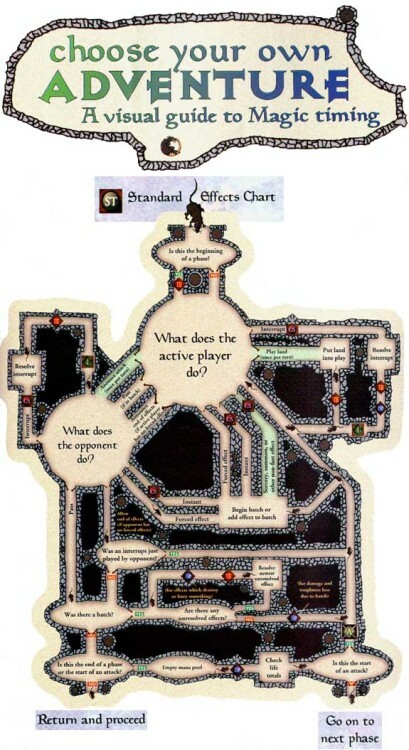 This release includes a cycle of Curses that cause something to happen when the enchanted player is attacked. A Curse spell targets the player it will enchant like any other Aura spell, and a Curse stays on the battlefield like any other Aura. 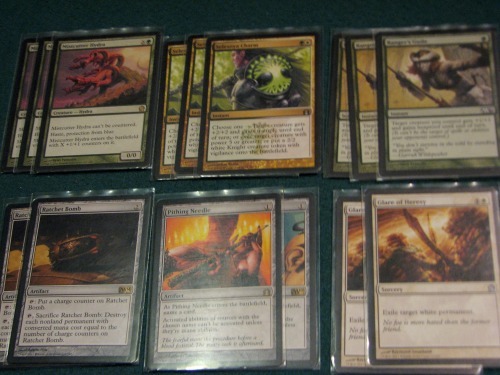 Each Commander 2013 deck has access to three of the five curses. — Curse of the Forsake, Curse of Inertia, Curse of Shallow Graves, Curse of Chaos, and Curse of Predation. Tempting Offer is an ability word that appears in italics on a cycle of sorceries. These cards have a beneficial effect, then give opponents the option to also enjoy that effect if they allow you to repeat it. (An ability word has no rules meaning.) Your opponents decide in turn order whether or not they accept the offer, starting with the opponent on your left. Each opponent will know the decisions of previous opponents in turn order when making his or her decision. 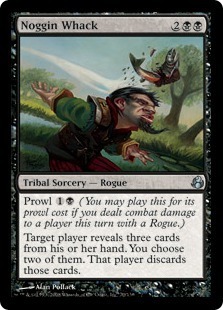 Each Commander 2013 deck has a card with the new ability word tempting offer. — Tempt with Glory, Tempt with Reflections, Tempt with Discovery, Tempt with Vengeance, and Tempt with Immortality. 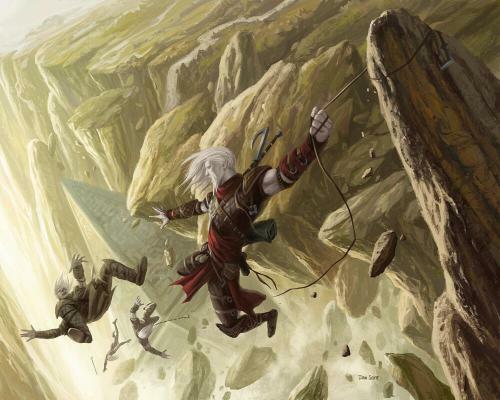 We wanted to yatter to you a bit about Theros Game Day last weekend. 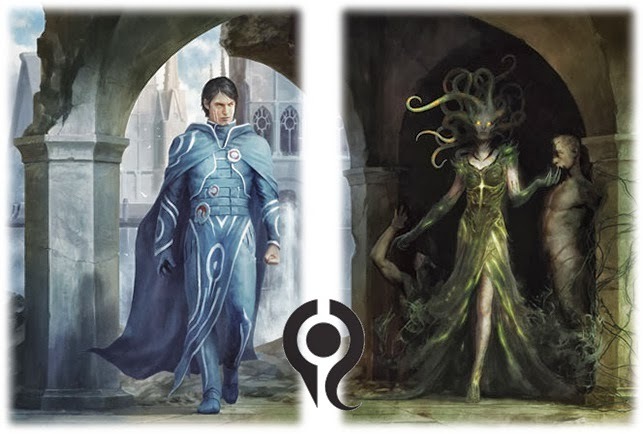 We took a Selesnya green white aggro build with us and lost quite decidedly, which was odd as it did so well at the Friday Night Magic event just the week before. What we did see at the card shop was a metric ton of devotion strategies, mostly blue and white. 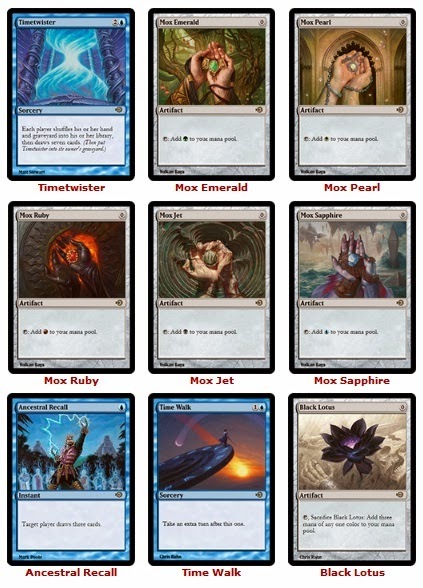 We also saw a lot of white soldier tokens via Elspeth, Sun's Champion and blue Elemental tokens via Master of Waves. Thank goodness that anthems like Intangible Virtue is no longer standard legal. We did appreciate our inclusion of the hexproof Witchstalker and the pro-blue Mistcutter Hydra, but wish we had addressed the increased numbers of Planeswalkers and those irritating tokens. No worries, we fiddled a bit and made some room in the sideboard. We also are now thinking of putting more of a hexproof aura slant on this with Nylea, that Green god card and Heliod, the white one to help boost the enchantment count for our Ethereal Armor - we might order a few extra cards from MTG Mint Card in a week or two. Anywhoos - here's the build as it stands today . . .
Firstly, we would like to grab another Loxodon Smiter, Voice of Resurgence and Temple Garden, but we would rather make rent and eat. After a few weeks of this iteration, we may include the green and white gods and may even consider Oath of Ancient Wood. Sideboard for our local meta-game right now addresses the biggest threats presented by all those blue and white builds, their Planeswalkers and token producers. Anywhoos - it's a lovely work in progress. Hope everyone had a great time at Theros Game Day over the weekend if you went. We went to OMG! Games here in Barrie, Ontario and washed out (1-2 drop) with our G/W Aggro build which took us to fourth place just the previous Friday Night Magic event. Afterwards, we developed a few modifications to make our strategy a bit more robust to the huge variety in our metagame but will need to grab a few more singles from MTG Mint Card. We also finally met MrScottyMac, The Eh Team member, LegitMTG writer and all-round good guy. 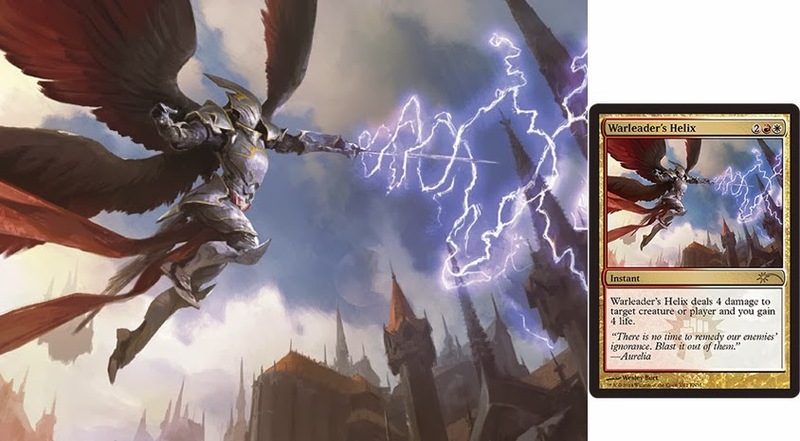 We also have a short video buzz through the Theros Game Day event as well . .
Next up - congratulations to Brian Braun-Duin who won the standard format Grand Prix tournament In Louisville this weekend with his Black Devotion build. 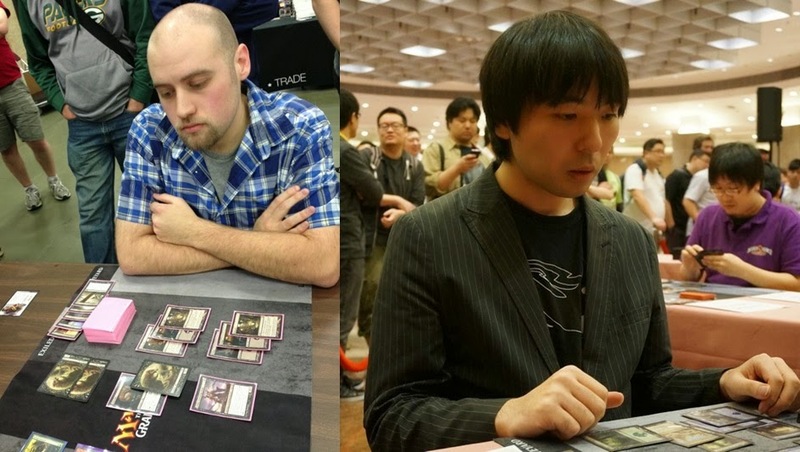 Shuhei Nakamura won the sealed format Hong Kong with a solid Green White draft. Check out the coverage on the mothersite. Anywhoos - onto today's article ! 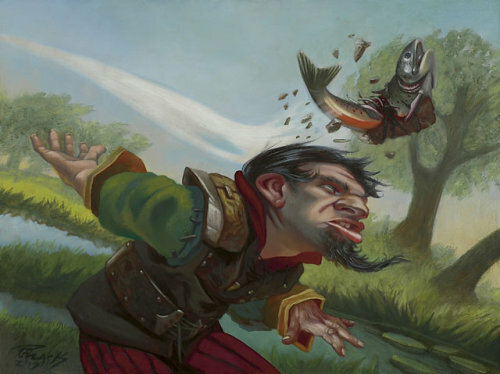 Over on the mothersite, we have an announcement from WotC with regards to the March 2014 Duel Decks . 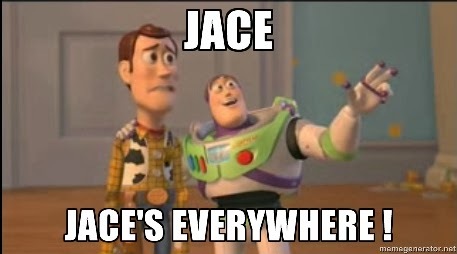 . .
Wow - yet another Jace. 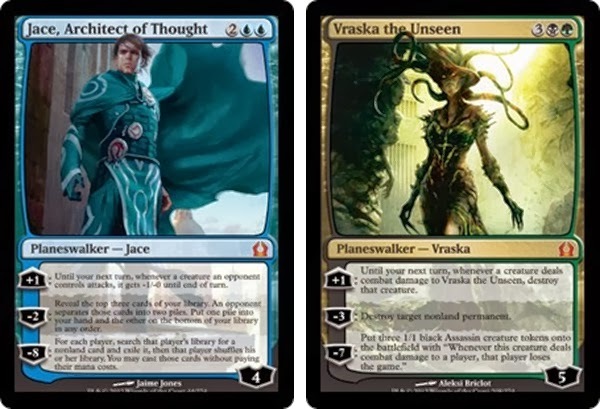 It seems like Wizards of the Coast really, really, really likes this Planeswalker. As soon as we read the announcement, all we could think was the look on Woody's face . 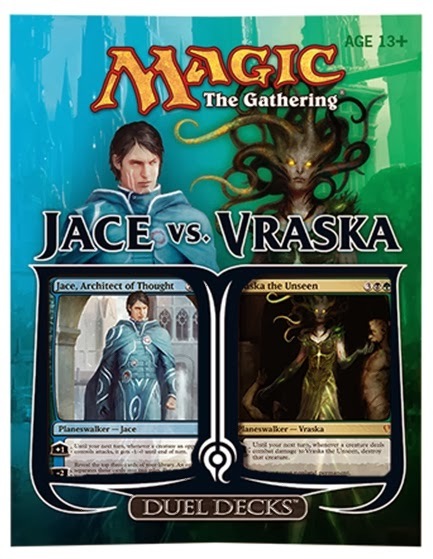 . .
We rather like Vraska but were kinda hoping for another Planeswalker (almost any other) on the other side of that box. We also have to talk about the art used here. Don't misunderstand us, we really love Igor Kieryluk - think about Elesh Norn, Grand Cenobite / Sangromancer / Enclave Cyrptologist - these beautiful arts are simply epic. What Wizards commissioned here was honestly rather terribad. Art appreciation is a personal thing and we are certain many players will love this new art (below) and will want to game with these new cards as soon as the product hits local gaming stores.